What causes feline hyperesthesia (hyperaesthesia)? The veterinarians and scientists don’t know. They speculate. I’d like to speculate too. What causes feline hyperesthesia. Raw picture in public domain. Words added. Perhaps the symptoms of feline hyperesthesia might provide a clue. Also the fact that the cause is mysterious and unknown even by experts might help us to decide. The symptoms are skin rolling or twitching, compulsive self-grooming and biting or attacking the tail. The skin twitches and their tails whip. They don’t want to be touched as if the skin is very sensitive and pupils are dilated. It is not clear if the problem is behavioural or neurological. The experts are at a dead loss as to the cause. Although some say it is epilepsy or a behavioural disorder caused by trauma. What about chemical pollution in the atmosphere of the home? There are at least two known sources of chemical pollution in many homes: fire retardants in soft furnishings and the chemical treatment of carpets. I have written about cats and carpets before but I’ll list the possible chemicals in carpets below – note: there might some overlap in the list. So why don’t cat guardians with cats suffering from this mysterious disease take up their carpets and see if there is an improvement? I’d always recommend a non-carpeted home for cat owners. It just makes sense on a number of levels including eliminating fleas if they are a problem. The classic treatment for feline hyperesthesia is to expose the cat to yet more chemicals! These include anti-seizure meds and steroids. It does not make sense to me. I think ‘poor cats’. I have mentioned flame or fire retardants in the list above. They are also present in sofas etc.. There are new rules on their use in many countries and in the USA on a state-by-state basis. The restrictions are due to the toxic nature of these chemicals. For me the law is confusing and flame retardants are likely to still exist in many millions of items of furniture in Western countries. These chemicals are nasty. The restrictions are designed to protect people but what about cats and dogs – second class citizens. The most commonly detected fire retardant, known as TDCPP, has been shown in animal studies to cause cancer. When buying new furniture cat owners should ensure that the item does not contain poisons that might harm their cat. A 2008 study found that dogs and cats in the USA were polluted with flame retardants at levels higher than for people. 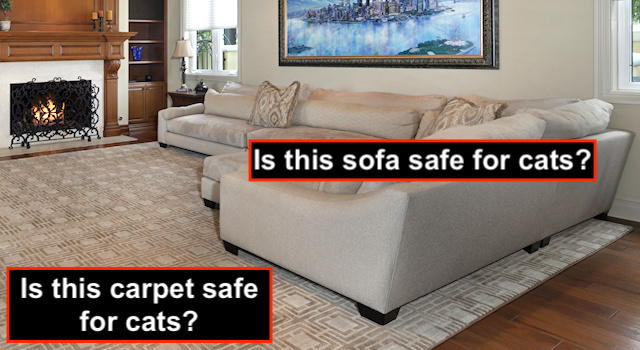 Both for carpets and sofas pets are more exposed because they are nearer the chemicals and because they lick the chemicals off themselves and ingest them. The chemicals are in the dust flying around the home. I feel quite strongly that sofas and carpets could be seriously harming some pets. We need a study urgently. What causes feline hyperesthesia? Maybe its chemicals in the home. We need to know and clarify. This entry was posted in hyperesthesia and tagged cat health problems, feline hyperesthesia by Michael Broad. Bookmark the permalink. The chemical aspect is chilling. We have very old wool carpets, all armchairs and sofas are covered in washable throws. I don’t doubt that, in ths home, we are all full to the brim with these toxic substances. Once had a female cat who developed the skin rolling symptom. It was not severe but was noticeable. There was no fur pulling. Unavoidably, noisy builders had been in the house for a few weeks prior to these issues and she had had a nasty bout of stress related UTI during that time. It was successfully treated, but it took persistent treatment. The vet suggested that the skin rolling might have developed due to the onset of a slight diabetes related neuropathy, possibly in the bladder. On a low carb diet plus a course of glipizide, the diabetes resolved within a few months. She was on meloxicam for less than a month and the skin rolling stopped, pretty quickly. The overall verdict was that all 3 issues were caused by environmental stress. Maybe some of that stress was chemical in origin? The glipizide caused her to put on a lot of weight too. Hey, thanks Jane for your useful input. I just had put my thoughts down on this one because almost no one discusses these damn chemicals which are so poisonous. It is beyond depressing when one thinks about the dreadful legacy left by the advancement of chemistry & the pursuit of profit. C-8 or GEN-X anyone? If I start typing about that, I will break the internet. There are just too many humans and our brains got too big, too quickly. Evolution has awful anomalies sometimes, but mostly those mistakes are self limiting, paws crossed.